'Fortnite' cosplay can actually help people calm down. She speaks in a low, patient whisper punctuated by a wide smile, her face inches away from the camera. Her voice is soothing and her eyes are warm. "Let me give you this shield potion," she says, reaching out of frame. "I only have one of them, all right, so you can have it." She pulls out a squat mason jar filled with baby-blue liquid, a blue ribbon tied around the top. She taps the sides of the glass with her fingernails and continues whispering, talking about all the items she found after gliding onto the battlefield a few minutes ago. She doesn't have any guns, but she picked up a lot of healing items. She hands the mason jar to the viewer behind the camera and the scene changes -- she looks excited, eyes wide, but she's still whispering. "What? I didn't notice it either, it was just right here. Check it out." She reaches beneath the lens again and pulls up a purple-and-blue llama piñata. "This doesn't look like a normal llama. It's like a baby." She holds up the piñata, softly crunching its paper sides and speculating about the goodies it might have inside. 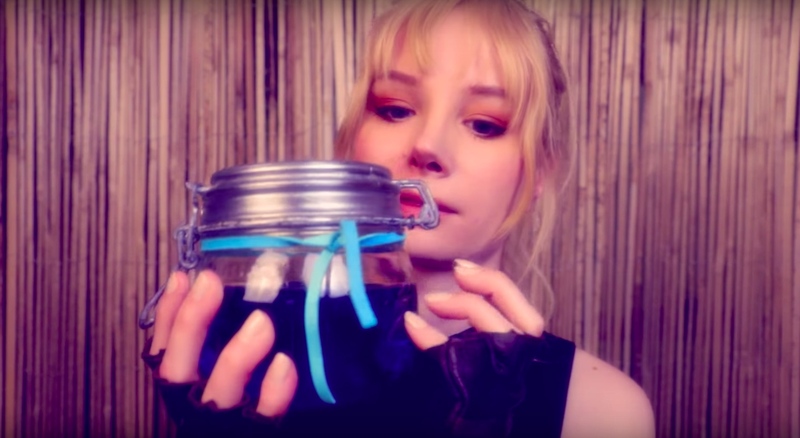 Bluewhisper is an ASMR content creator (or ASMRtist if you're feeling cute), meaning her YouTube uploads are packed with close-up videos of her face and hands, softly touching things and speaking in a breathy, calm cadence. ASMR stands for autonomous sensory meridian response, and people who experience it describe feeling "tingles" or "brain orgasms" -- a pleasant sensation that travels from the crown of the head down the spine. Bluewhisper films a lot of role-playing scenarios, where she's a doctor, makeup artist, hair stylist and even a colonial-era barber, bonnet and all. In a handful of her videos, Bluewhisper dresses up as characters from popular video games, including Overwatch and Fortnite, and acts out situations that fans can relate to. Last year, she uploaded an ASMR-themed Let's Play video, where she quietly talked to an unseen audience while playing the 1999 city-building sim Pharaoh. "Video games are diverse, so there's a lot of material to work with," Bluewhisper, who's in her twenties, told Engadget. "I thought healing and reviving would be the perfect theme for a Fortnite video. My audience loves nurse and doctor role-plays, so it fit well." Bluewhisper got her start doing video-game-themed ASMR videos; her first channel was all Let's Plays of classic PC games. Today, Bluewhisper has 178,000 subscribers and more than 33 million views on her channel. She's not alone. ASMR has exploded in popularity over the past few years, and there are thousands of videos with millions of views on YouTube featuring quiet conversation, fingernail tapping, slow unboxings, soft brushing and soothing crinkle sounds. Anecdotally, the videos help people fall asleep and generally calm down. "It's not just people telling us that ASMR makes them feel relaxed; their physiology is telling us the same thing." Science is catching up to these stories. In June, Dr. Giulia Poerio of the University of Sheffield conducted the first study of its kind, looking into the physiological effects of watching ASMR videos. The study found that those who responded to ASMR experienced greatly reduced heart rates (down an average of 3.14 beats per minute) and reported feeling more relaxed and socially connected than those who didn't feel any brain tingles. The results mirrored findings in other, established stress-reduction methods, including music and mindfulness. "Our research studies consistently show that ASMR is a relaxing, calming sensation that increases feelings of social connectedness," Dr. Poerio told Engadget. "Importantly, we found that ASMR videos produce significant reductions in heart rate in people who experience ASMR -- so we now have more objective evidence of the idea that ASMR is relaxing. It's not just people telling us that ASMR makes them feel relaxed; their physiology is telling us the same thing." Though ASMR isn't a new phenomenon, it's only recently been given a name and entered widespread consciousness, thanks in large part to YouTube and Reddit communities. Only some people are affected by these soft, repetitive noises -- show anyone an ASMR video and, within seconds, they'll either recoil in discomfort or be utterly engrossed. It's unclear why some people experience ASMR tingles and others don't, but Dr. Poerio has ideas about how to better understand this disparity. "Drawing on music-induced chills research would be one way to shed light on this," she said. "For example, there has been research to suggest that people who experience music-induced chills have greater white matter connectivity between auditory and emotional brain regions. This could also be the case in those who experience ASMR, but we would need brain-imaging studies to test this idea." ASMR videos come in a wide range of styles and themes, from slumber-party role-plays to two hours of tapping -- no talking -- on a variety of tingly objects. However, scroll through a list of ASMR videos on YouTube and a curious trend emerges: There are a significant number of video-game-themed ASMR videos, featuring ASMRtists dressed up as characters, pretending to work in a game store, or simply tapping on controllers and boxes of their favorite games. Catplant is a 26-year-old ASMR creator who focuses on video game content. She has 130,000 subscribers and regularly role-plays, dressing up as characters from BioShock, Fortnite, Overwatch, Silent Hill, Final Fantasy and even cult-favorite games like Doki Doki Literature Club. She didn't start out doing ASMR, but after she uploaded a handful of videos to YouTube, commenters suggested she try it out, because she had an "ASMR voice." At first she didn't get it. "Finally, an internet friend of mine wrote me and shared his favorite ASMR trigger videos," Catplant told Engadget. "When I watched them, I instantly felt tingles and relaxation, and knew that I had to try to make these videos because they were so relaxing for me. And I wanted people to feel good, too." Video games were a natural theme for Catplant to dive into. "I honestly didn't think too much before making my gaming-related videos," Catplant said. "I went to the store, bought a Yeti mic and used my webcam, grabbed a bunch of games that I owned, and recorded. I felt most comfortable discussing video games, because I spent most of my life playing games and didn't know what else to talk about for a video." "I felt most comfortable discussing video games because I spent most of my life playing games." Catplant and Bluewhisper have both noticed a video game trend within ASMR, especially when it comes to Fortnite, the blockbuster online title from Epic Games. There's more ASMR content than ever on YouTube, and there are dozens of specialized themes, including movies and other pop culture references, but video games are particularly pervasive. It's not surprising, considering the upward trajectory of the video game industry overall -- according to Statista, it's grown from $54 billion in 2011 to an expected $82 billion in 2018, with no signs of slowing down. Fortnite is arguably the most popular video game in existence today, with more than 125 million players and a burgeoning esports scene worth $100 million in 2018 alone. Fortnite is on track to bring in $2 billion in revenue this year -- a figure that's particularly notable considering the game itself is free. Epic makes money by selling in-game items, and this strategy has boosted the studio's net worth to $8 billion. Not surprisingly, Fortnite is also arguably the most popular video game in the world of ASMR. The advent of live-streaming, esports and YouTube Let's Plays has helped propel the video game industry into the mainstream; playing games is no longer a fringe activity, holding as much cultural weight as watching movies or reading bestsellers. ASMRtists are making video-game-themed videos because they already associate video games with relaxation or "me time." In the current pop culture climate, video games are a natural fit for ASMR. "There is definitely a trend with video games and ASMR," Catplant said. "I did an ASMR Outlast gameplay video and, although the graphics were quite frightening, the ASMR element provided a level of comfort for the viewer watching it, allowing for tingles to soothe whoever from being truly frightened. It allowed for the game to be seen in a different way, and to be used for new purposes, allowing for creativity and promoting a new form of relaxation." Video games aren't necessarily better suited to ASMR than other forms of entertainment, but they're diverse and infused with nostalgia, offering an inherent calming effect for many people who grew up playing them. "Anything that makes the experience of ASMR more realistic is likely to intensify the experience," Dr. Poerio said. More realistic -- or more fantastical, depending on the game.